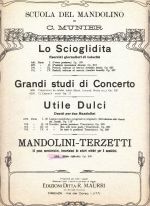 On this page I provide several complete methods for the mandolin and some sheet music of pieces for the mandolin or guitar. 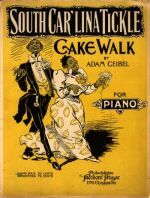 All pieces have been published more than 70 years ago and are no more protected by copyright. I am currently preparing special pages with mandolin music as a complete set with information, sheet music as pdf, and midi files. 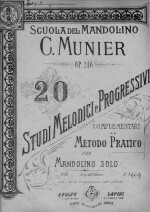 I am planning to include interesting pieces from mandolin methods and studies which are usefull for learning the mandolin. Luis Diaz-Jimenez Solaz from Valencia in Spain has told me about an ebay auction for part 4 of this song collection. I could buy it and have made a scan. Karl Friedenthal was a professor in Vienna around 1920 / 1930. 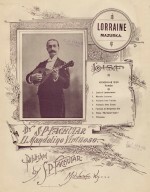 He has also taught the mandolin and publishes a set of stidies for the mandolin taken from other authors. 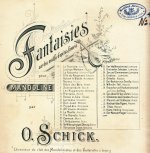 This is a nice selection of dances in the style that was popular in Paris around 1900, including Polka, Mazurka, Schottisch, Waltz and Quadrille. 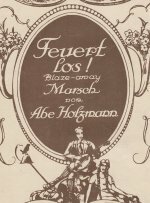 kollmaneck_die_spieldose.pdf For Glockenspiel and mandolin orchestra! 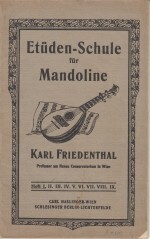 Please check the page about mandolin methods for more free downloads! 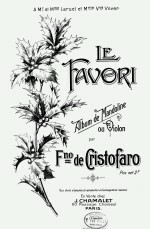 This exercise by Fiorillo is very nice. I use the gliding downstroke and like it especially, when the notes sound together like chords. Here are three pieces for beginners from a collection of pieces from 1740. 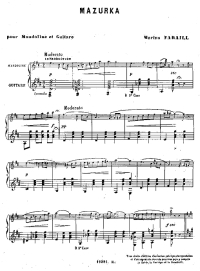 I have transcribed the pieces to keys which are good for the mandolin. Hörst du die Mühle, ticke tacke? A great Danish folk song that I have heard in a version by the famous Norwegian singer Sissel. This is one of the most viewed pages of my website - so I have added the visitor-counter here too.